Now that the kids are back to school, it’s a great time to spice up your cold lunches and learn more about the School Lunch Program, otherwise known as “hot lunch”. There have been some changes to the School Lunch Program over the past few years and it’s always great to learn about the nutrition guidelines your school is following. School lunch has evolved and now includes many more appetizing items, fruits and vegetables than in years past. You can find information on some of the recent changes here. Some schools also offer breakfast, which we all know is “the most important meal of the day”. Although we have all heard this message before, do we all eat breakfast? It is especially important for children to have breakfast everyday to make sure they are getting all of the vitamins and nutrients their bodies need. 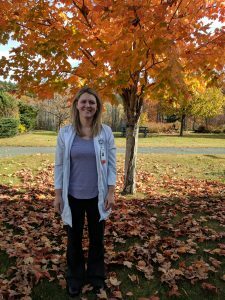 Since they are not able to eat large volumes of food at each meal like adults do they need to eat more frequently, which should start with breakfast. Having breakfast sets them up for a better day, especially at school so they can concentrate on learning instead of thinking about their rumbling belly. Some easy breakfast ideas for home can be found here. What is going to go in the lunch box today? Every parent asks themselves and probably their child this several times a week if you’re packing cold lunches. It doesn’t have to be rocket science or Pinterest-worthy. Easy and nutritious is good enough! 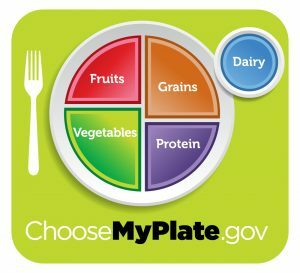 Trying to follow MyPlate and including foods from most of the food groups should be your goal. Kids start eating with their eyes first so trying to make it look fun and exciting is a bonus. Fruits and vegetables are really colorful and can help brighten up a boring looking lunch. Even cutting fruits and vegetables into shapes that you don’t normally use can make a difference. Making homemade versions of Lunchables® is not only acceptable but encouraged! Letting kids custom build a meal they want is exciting. Try to skip the high salt and high sugar items in your homemade version though. Feel like you’re in a rut and always packing the same thing? Try these ideas. 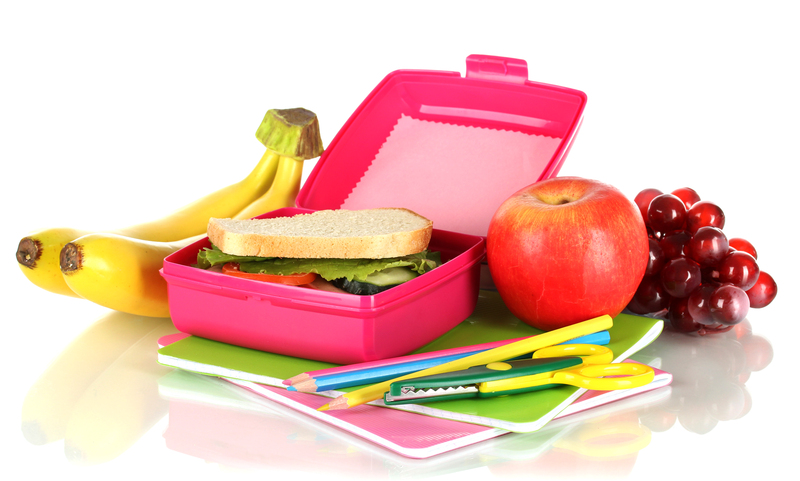 Encourage your child to make healthy choices if they’re using the School Lunch Program. Talk to your kids about avoiding the “fast food” type options like pizza, fried chicken, and French fries. Or, if they are going to choose them anyways, encourage them to have a smaller portion and include a fruit or vegetable as well. Most schools have a weekly or monthly menu available. Discuss the options ahead of time to encourage better choices. The base for making healthy choices at school comes from making healthy meals and choices at home. Include a fruit and/or vegetable at every meal, include lean proteins and non-meat proteins, whole grains, choose low fat or non-fat dairy products, and limit added salt and sugar. Want to try a new vegetable but don’t want a meltdown at the table? Try taking your child grocery shopping and explaining where the produce comes from and how it’s grown. Let them pick something that appeals to them. Then get the kids in the kitchen! The more exposure they have to new foods the more comfortable they become with them. Sometimes kids have to try the same thing at least 10 times before they might like it. Kids will also be more likely to try something they have helped prepare. Here are some stove-free meal ideas that the kids can help with. Kids can also tear up lettuce (even if it doesn’t need it! ), use cookie cutters to cut shapes out of foods, stir things, pour things, and assemble things.